One of the joys of hiking in Britain is that you can end every day with a pint of beer. Even the remotest hamlets will have a pub, even if there's barely enough inhabitants to staff it, let alone provide customers. To take advantage of this, we set out on the mother of all pub crawls – 40 miles from bar to bar along the West Highland Way. Sitting in Lauders pub in the center of Glasgow, I savored my first pint of '80 shilling', the national beer that I've never seen outside of Scotland. It's closest to what you'd call a 'bitter' in England, dark, rich and not fizzy like the typical 'lager' beers in the US. Every brewery has its own version and you'll rarely go wrong in Scotland if you ask for 'a pint of 80'. As we enjoyed our pints, we were entertained by a group of 12 year-olds smoking cigarettes and spattering each other by stamping on ketchup packets. The next day, we caught the train to the start of our hike, Crianlarich, about half-way along the Way from its beginnings in Glasgow. The station itself had the world's tiniest tea-room squeezed into what appeared to be a converted toilet cubicle on the platform, but fortified by visions of a luke-warm pint at the end of the day we started out on our hike. Though our first stage was only six miles, we stumbled over the sort of history that tends to accumulate in a small country that's been inhabited for 8,000 years. We passed a pond that Robert the Bruce had thrown away his sword whilst being pursued, and slightly later where he stopped and defeated the pursuers. From my memories of Dundee's nightlife, I'm guessing he just head-butted them into submission. We rapidly realized that most people weren't carrying 30 pound packs, and instead had taken advantage of the van shuttle services to take their gear between each stop. That just seemed like cheating, but then we weren't the real hard-core, carrying all their camping gear in even heavier packs, or even running the whole 95 miles in under 24 hours! Just before we arrived in Tyndrum, a large patch of bare earth accompanied a cheery sign explaining that the are had been used for hundreds of years to crush lead ore using child labor, leaving it poisoned and lifeless, and pointing just off the trail to our B&B. Happily it was upstream from the old leadworks, but it was yet another reason to stick to refreshments other than tap-water. Wandering bedraggled into Glengarry House, we were immediately greeted by the owners Ellen and Pat. Wonderfully helpful, they magicked up a welcome cup of tea as we got settled in our room, and we started to regret our plans to eat out that night as we smelt the meal they prepared for their other guests. Steeling ourselves, we wandered half a mile down the way to Tyndrum proper, and made ourselves at home in Paddy's Bar. 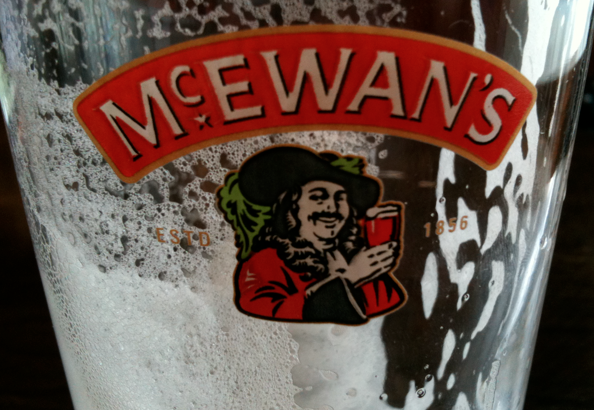 My McEwans 80 shilling hit the spot, but the place itself was fairly anonymous, a bit like a converted portakabin. Moving across the road for food, The Real Food Cafe was stupendous, with ana amazing menu of lovingly prepared versions of British classics like fish and chips, all using local, organic and even gluten-free ingredients. The seating was at two long bars, which led to a lot of socialising between the parties. Next morning we chatted to our hosts a little more (apparently April is a much quieter month than May, with just as good weather) we strapped on our packs and, after a brief diversion to The Green Welly Stop for postcards, we headed for our next stop at Bridge of Orchy. Again, this was a short stage, only 7 miles, but it still left our feet aching as we came down the hill into the village. 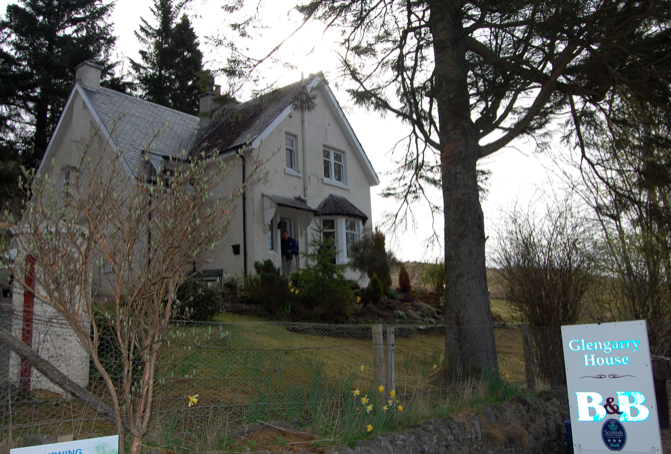 I'd booked us into the main rooms at the Bridge of Orchy Hotel (they also have a bunkhouse), and the staff treated us like kings. Almost entirely staffed by South Africans, both my pint of Belhaven Best and the following meal of salmon were superb and delivered with great ceremony. The barmaid offered me a tasting glass of some of the other beers while we were browsing, and Liz was handed an impressive data sheet on the different characteristics of the whiskies after she asked the bar tender's advice. The receptionist enthusiastically told us "That's sensational!" after she heard that we'd done an extra reconnaissance hike up the hill that evening, which became our phrase of the day. Day 3 was the first of the tough hikes, 12 miles to the Kingshouse pub with 1500 feet of elevation. We had a slog up and over the ridge we'd explored the night before, passing the Inveroran hotel and campground, then a seemingly never-ending march up a sloping old drovers road, headed to Ba Bridge. We were apprehensive about this section because we'd seen signs warning that the track was going to be used as part of the Six Day Trials motorbike event, and we did get passed by a few, but they were remarkably quiet, more like mopeds than the Harleys we used to live next door to in California. It was fascinating to watch 'guys trying to ride a motorbike up a waterfall' as Liz put it, and I was actually glad we caught them up close. 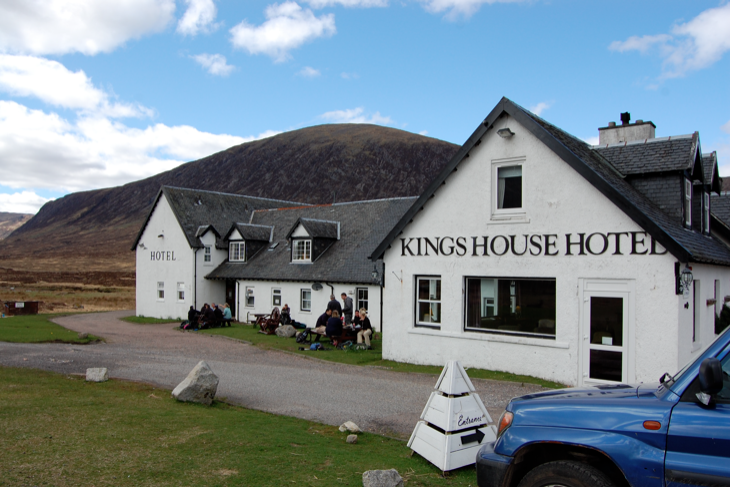 The Kingshouse pub appears as you come over the final ridge, and it looks deceptively close. When we finally arrived, we both nursed a Calder's 80 Shilling and called for a taxi to our B&B, since Kingshouse is alone in the middle of a stunningly beautiful stretch of moorland and they'd been booked up even 5 months ago! The taxi was going to take a while to get to us, so we ended up having a second pint which led to a very chatty ride. 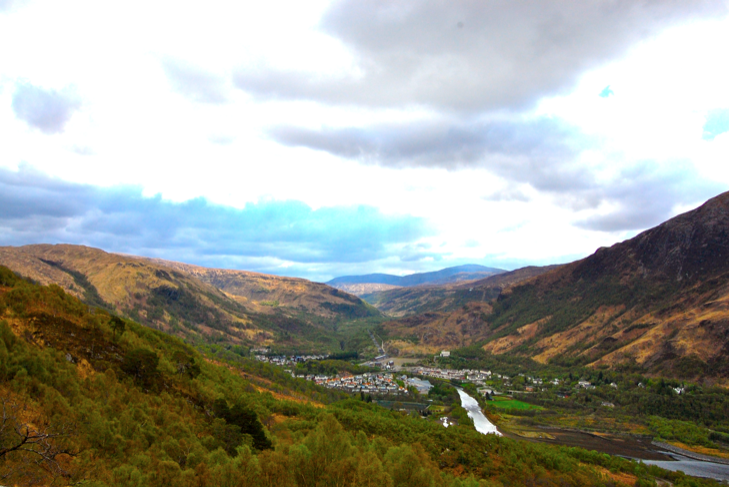 Kinlochleven itself is in a valley at the head of a loch, surrounded by steep hills wooded with beech trees that looked golden with the sun on their spring leaves. The view took my breath away, and our room at The Highland Getaway had a back window looking out onto a wide stream. Wandering around the town, we stopped at the Tailrace Inn for dinner and another pint. It felt like a traditional British pub, my Tennant's Ember 80 shilling was almost spicy, but Liz's request for whiskies was met by the barman with a scowl and a gesture at the shelf behind him. A final whisky at the Harlequin Cafe attached to our B&B was a lot more pleasant, with the dark wood and red wallpaper that every pub needs. I had high hopes for our final lodging, the Cruachan Hotel. As Liz said when she saw its website "it looks like a castle! ", and I'd gone crazy and spent $200 for the night. I had my first misgivings when the sign out the front advertised vacancies and $75 rooms for two. That first impression was borne out by the pokey room that looked like a time capsule from 1973, complete with no toilet lid, a single pillow each that was flat as a pancake, mould in the bathroom and strange stains on the wall heater. We really didn't care though, we'd made it! It was an amazing trip, I just wish we could have had more time and managed the whole 95 miles. 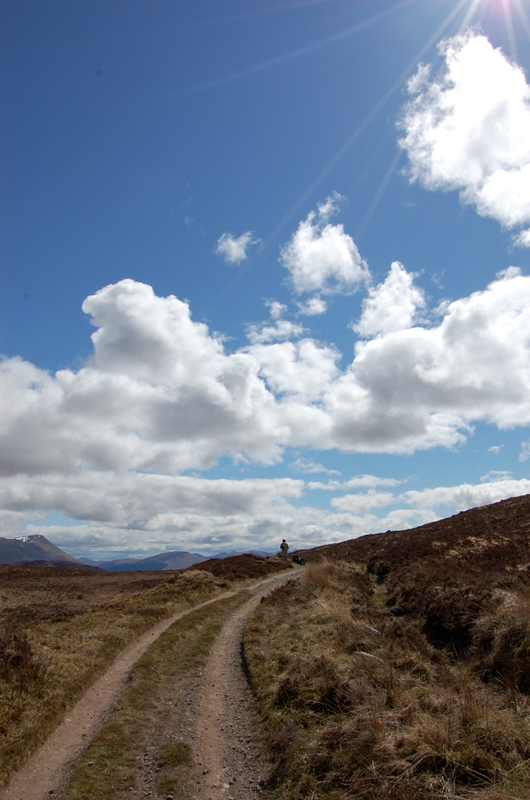 The West Highland Way is a hidden treasure, I was surprised at how few people we encountered, and almost everyone was local. If you're considering a visit to Scotland and want to experience that amazing landscape up close, I can't think of a better vacation. Just don't forget to check out the '80'!